Johnny Football might have partied his way out of the NFL. The Cleveland Browns drafted Johnny Manziel and all of his baggage in the first round of the 2014 draft with the hopes of shaping him into an elite franchise quarterback. Instead, he has toiled away on the bench for most of his young career, making more headlines for his off-field indiscretions than anything he accomplished on game day. Manziel checked himself into rehab last year for alcoholism, emerging 10 weeks later with the full support of his team. But any goodwill Manziel still had left has whittled down to nothing after multiple relapses, excessive partying, violations of team rules and repeatedly lying to the public and to his team. 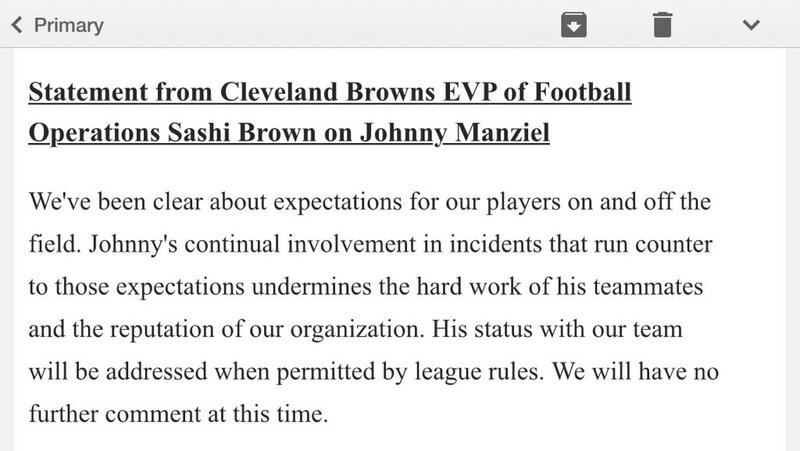 In a statement released on Tuesday, the Browns did everything short of formally part ways with their quarterback. For reasons having to do with the league’s salary cap, the earliest the team could cut Manziel is March 9, but it appears likely that Manziel’s career in Cleveland is over. The team could also offload Manziel in a trade, which would save them money. Fortunately for them, there are still teams in need of quarterbacks if they believe that they are able to get Manziel the help he clearly needs. The Dallas Cowboys have been rumored to be among those interested in him as a backup to the increasingly fragile Tony Romo. Same goes for the Saints, home of aging gunslinger Drew Brees, and the newly minted LA Rams. Johnny Football in Hollywood? Perish the thought.